Lasvegas USA casino review. rtg casino software. CasinoBonusNews → Casinos → "LasvegasUSA Casino review"
As the name implies, Las Vegas USA casino is one of the few online casinos that take in guests from the United States. Although it has a global presence in the world of online gambling, Las Vegas USA takes pride in its U.S. customers. As with all casinos that use Real Time Gaming software, the casino is available in both a free download software version and a no-download internet-based version, so players with either a Mac or a PC can enjoy the show. 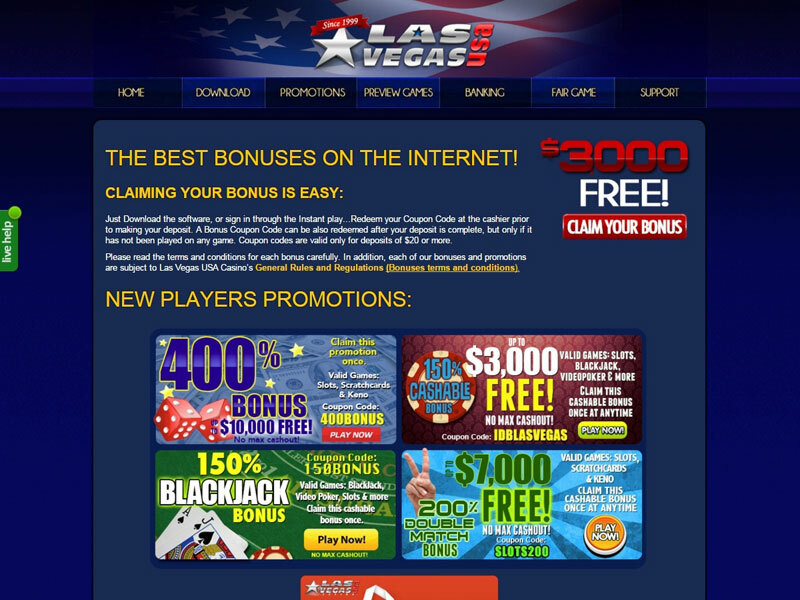 Brand new players signing up at Las Vegas USA must take advantage of the current welcome bonus promotion being offered, which is an impressive 125 percent bonus on all deposits from $20 to $100, and any deposits more than that amount will receive an extra 25 percent in bonus money on the rest of the deposit. Then, for an extra boost, anyone using MST Gift cards for their initial bonus will find another $25 in their account when they log in. To be withdraw money, players must make wagers on valid games, such as slot machines, that equal 30 times the first deposit plus the bonus funds, or equal 50 times on games such as video poker, blackjack, Perfect Pairs or Caribbean Stud. After meeting the requirements of the bonus, players can wander around to look at the other games available to wager on, such as Red Dog, craps, roulette, War or Tri Card Poker. Or, they can continue to roam through the more than 90 video slot machines on hand, including progressive jackpot games like Shopping Spree and Shopping Spree 2, or try for one of the progressive jackpots on the table games Let ‘Em Ride, Caribbean Draw Poker, Caribbean Hold’em or Caribbean Stud. 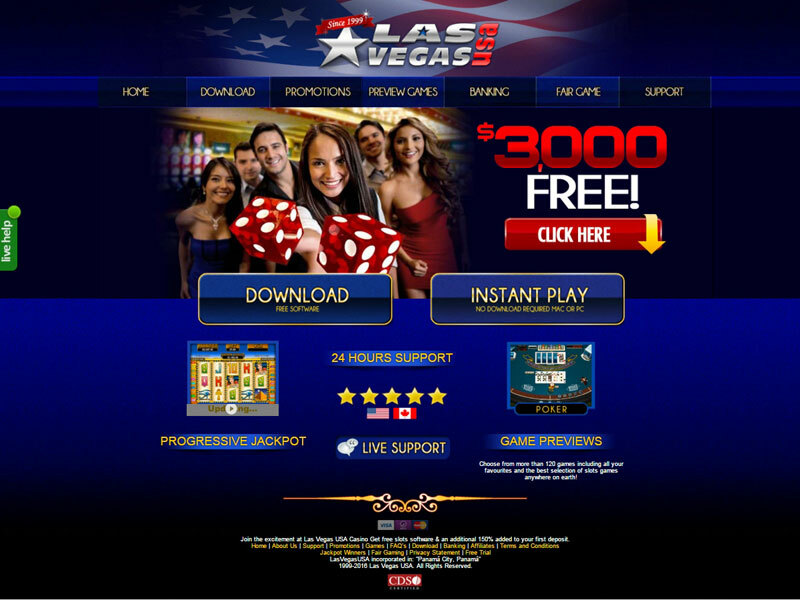 Players who stay with Las Vegas USA can continue receiving rewards like the loyalty rewards where players earn points playing games. Those points can be turned in to receive bonus cash, and the more points a player earns, the more powerful the loyalty points become. Then, players can look for the weekly drawing where 10 players receive $100 to wager on their favorite games. Enrolling with Las Vegas USA’s quick verification program will not only net the player an extra $20 bonus, but it will also guarantee that withdrawals will reach the customer faster and raise the player’s deposit limit to give him or her a larger bankroll to play with. A quick visit to the cashier and a few clicks is all it takes to safely deposit money into a Las Vegas USA account. 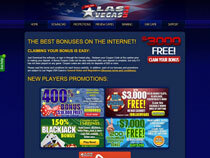 U.S player can use credit cards, MST Gift Cards or money orders to add money to their bankroll. They can withdraw winnings by check or by direct deposit into a checking account. Players from other parts of the world may use different depositing methods, like ClickandBuy, InstaDebit and NETeller. Players outside the U.S. can withdraw funds via check, money order or NETeller. Technical or banking questions can be dealt with quickly and easily through the three avenues of reaching 24-hour tech support: Live chat, toll-free telephone numbers or Email. However, downloading the software for the casino is simple and self-explanatory, so even the least tech-savvy players can have the casino up and running on their computers in little time. Las Vegas USA is proud of its fair gaming certification from Technical Systems Testing, and the casino promises players that all information is kept confidential and secure.